A select form named after the landscaper, Hardenbergia violaceae Edna Walling ‘Snow White’ is one of the prettiest of all. 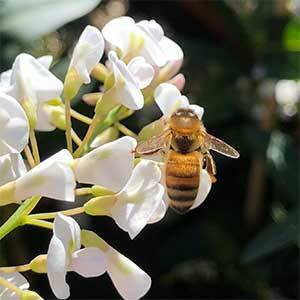 And to add to the attraction it attracts bees to the garden. Snow white flowers as the name suggests, and deep green glossy foliage make a great natural contrast. Many garden writers describe Hardenbergia as vigourous, we think this tends to give the plant a bit of a bad wrap, as this can be interoperated as invasive. Hardenbergia ‘Snow White’ may week be a strong growing plant, however it is never a problem in our garden. Variously described as a climbing plant and a ground cover, it is real a scrambling plant, easily trained to be well behaved. Best grown on a support, it looks great when grown along a low fence. Once established Hardenbergia ‘Snow White’ requires little to no extra care. It is often suggested that specialist fertilisers be used. We find this is not the case unless the soil is naturally impoverished. Pruning to maintain shape can be carried out after flowering. 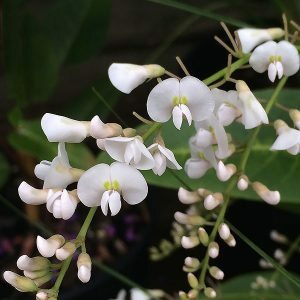 You can grow Hardenbergia ‘Snow White’ in a container if needed, use a very free draining potting mix and ensure that the container has adequate drainage holes. Height – If left on the ground, it will never reach over 20 cm in height. If given something to climb on it will get to 2 metres. Spread – Best pruned to around 2 metres for optimum growth, bushiness and flower production. Position – Full sun to part shade with good air circulation.